Description: The colony consists of an upright, sparsely and irregularly branched stem. It is usually solitary at the base but occasionally several individuals are aggregated. The main stems bear whorled (3-dimensional) side branches in groups of 6 which are fine and of even length, angled upwards. The hydrothecae are tiny and are well spaced on the uppersides of these branches. They are separated by an internode which lacks a feeding polyp, but is equipped with a small defensive polyp. Sometimes there are annulations between the internodes. The hydrotheca is tubular, with a flared, smooth rim. It is surrounded by 3 defensive polyps, 2 above, and 1 below. The base of the gonotheca is oval shaped, but gradually tapers, forming a tubular orifice. They are borne in clusters on the upper parts of the stem. This species is yellow to orange in colour, and is usually more pigmented than Nemertesia antennina. Habitat: This species is frequently encountered attached to bedrock, shells and pebbles at sites with slight to moderate tidal streams, but it is intolerant of wave action. On coasts exposed to the Atlantic swell it is normally found below 30m but may occur shallower if sheltered microhabitats are available. Ecology: Nemertesia ramosa is preyed upon by several species of nudibranch molluscs, including Doto fragilis, Doto cuspidata, Lomanotus genei and by the pycnogonid Endeis spinosa. 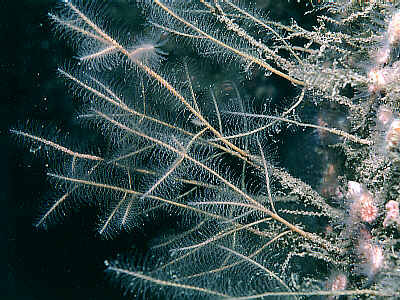 The epizoic hydroid Plumularia setacea frequently grows on this species. Distribution: Widely distributed around the British Isles. Similar Species: Nemertesia antennina is similar to this species but has unbranched main stems. Picton, B.E. & Morrow, C.C. (2016). Nemertesia ramosa Lamouroux, 1816. [In] Encyclopedia of Marine Life of Britain and Ireland.